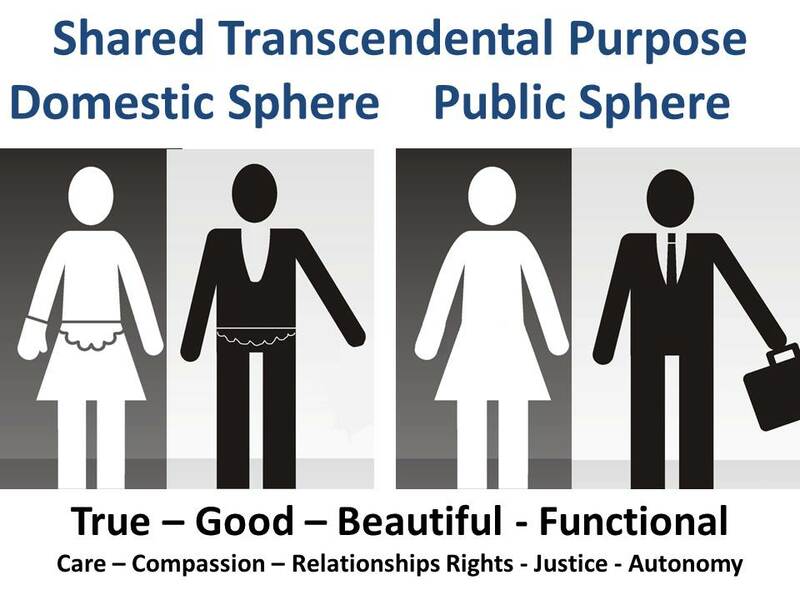 In an Integral Love Relationship, (1) equal and opposite partners with a (2) shared Biological and Transcendental Purpose and the (3) same rights and responsibilities in the domestic and public sphere love each other, and even more so that which is uniquely co-created between them, in (4) all four quadrants at (5) the level of all seven chakras by (6) balancing and harmonizing their healthy feminine and masculine polarities. This allows them to move from (7) asymmetrical transactional love relationships, to (8) symmetrical transcendental Integral Love Relationships (more below). Watch the Video at https://youtu.be/xbFTaBsYgJ0 and download the Power Point Presentation here. With equal we mean that the partners are at the same level of consciousness, spiritual, sexual and anima/animus complex development. This is illustrated by the personality matrix below. Note that you can have an Integral Love Relationship at any level of consciousness development, not only at an Integral or higher level. 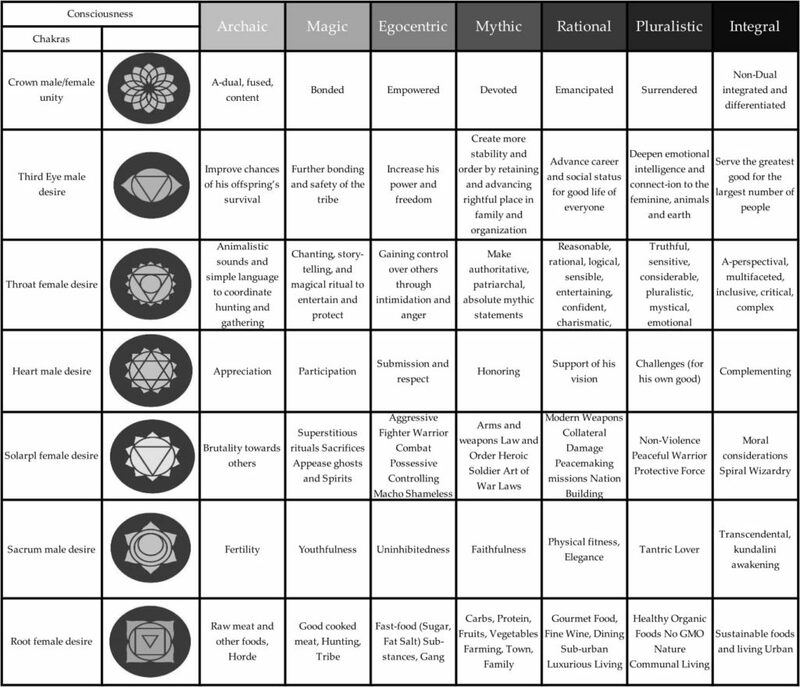 On the left side you see eight stages of consciousness development from Archaic to Transpersonal. 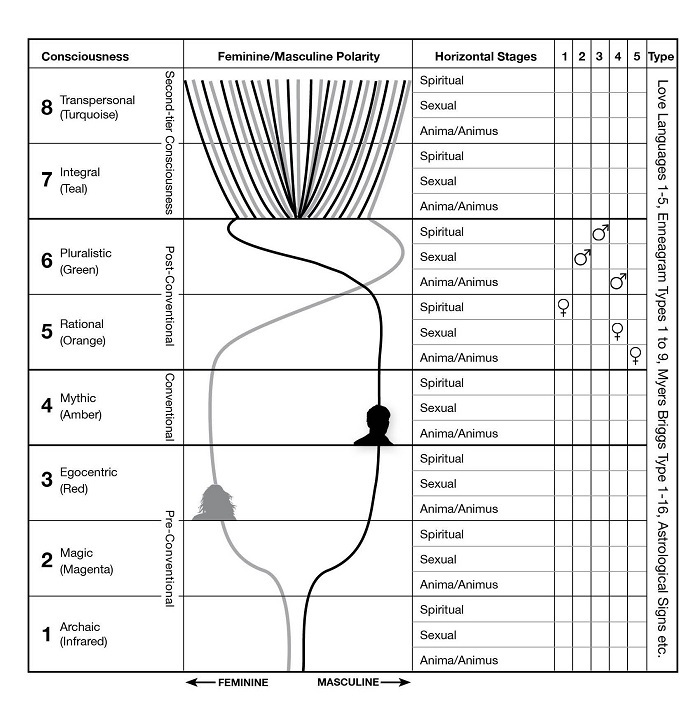 Next to the stages of consciousness you see two meandering vertical lines, showing the most common tendencies of the feminine and masculine polarities for males and females as they evolve in consciousness (more below). 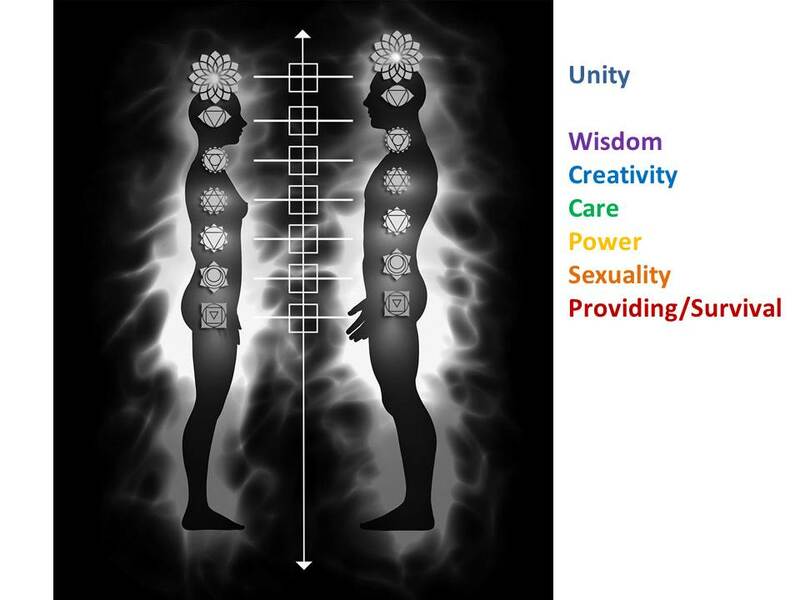 Located to the right of the two vertical lines of the feminine and masculine polarities on the Personality Matrix are three rows with the five state/stages of spiritual and sexual development and the five stages of anima/animus complex development that we explored above. 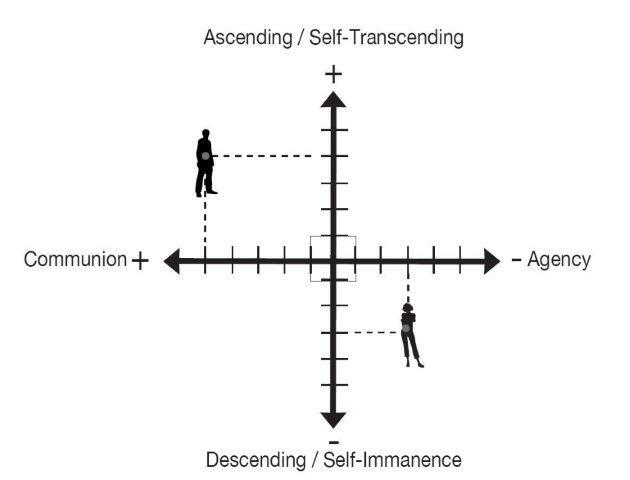 They are arranged separately on a horizontal axis for each of the vertical stages of consciousness development for three reasons: (1) they can develop independently at each level of consciousness and are then interpreted from that altitude; (2) spiritual and sexual development can be experienced as temporary states that may or may not be developed into a state-stages; and (3) their development can be interrelated. On the very right you see the various personality types such as Ennegram, Meyers Briggs, Love Languages etc. With opposite we mean that the partners complement each other in their opposite (or different) strengths (personality types, natural talents, feminine masculine polarities) to create synergy (as in opposites attract). 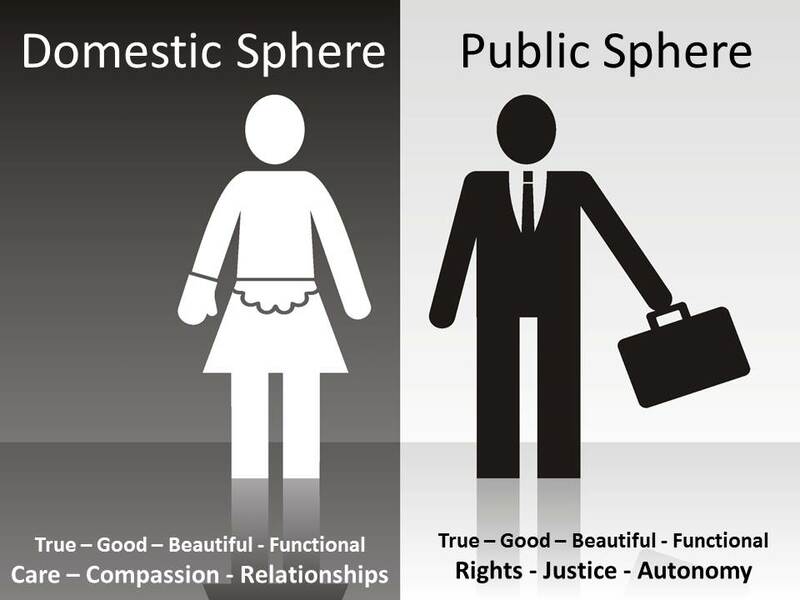 Traditionally, women had responsibilities and some rights in the domestic sphere, with the associated feminine qualities of care, compassion, feelings and relationships, and men had responsibilities and various rights in the public sphere, with the associated masculine qualities of rights, justice, rationality, and autonomy. With the rise of modernity and the female liberation movement, women gained the same rights as men in the public sphere, with the option to choose how many responsibilities (and masculine qualities) they would want to assume. Men on the other hand retained their rights and responsibilities in the public sphere, and sometimes assumed more responsibilities in the domestic sphere while losing their rights. Furthermore, most singles and single parents (men and women) had to assume responsibilities in both, the domestic and public sphere. Sharing our Transcendental Purpose opens the door to sharing the same rights and responsibilities in the domestic and public sphere. The key point to an Integral Love Relationship is that it is healthy in all four dimension (or quadrants) of our being. 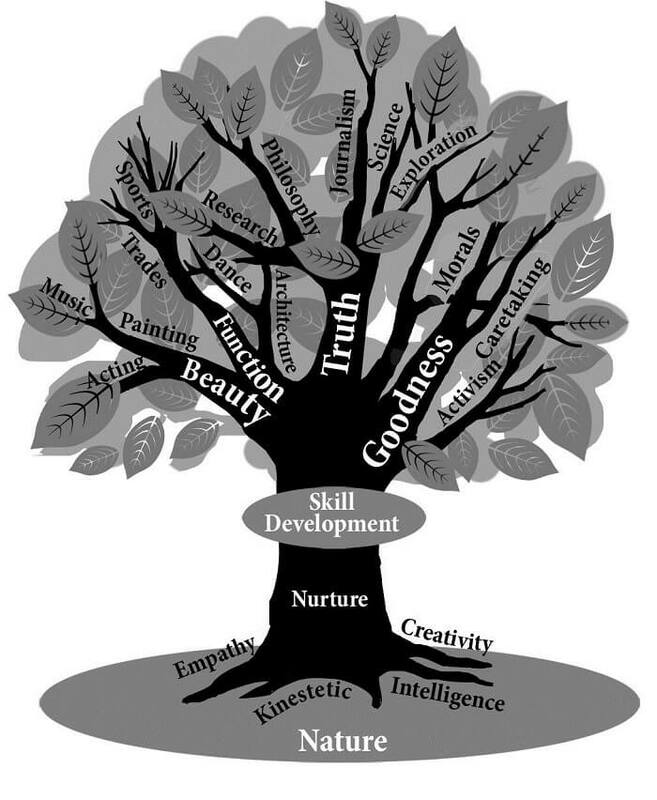 The individual interior “I” maturity, psychological health, spiritual awareness, and worldviews. 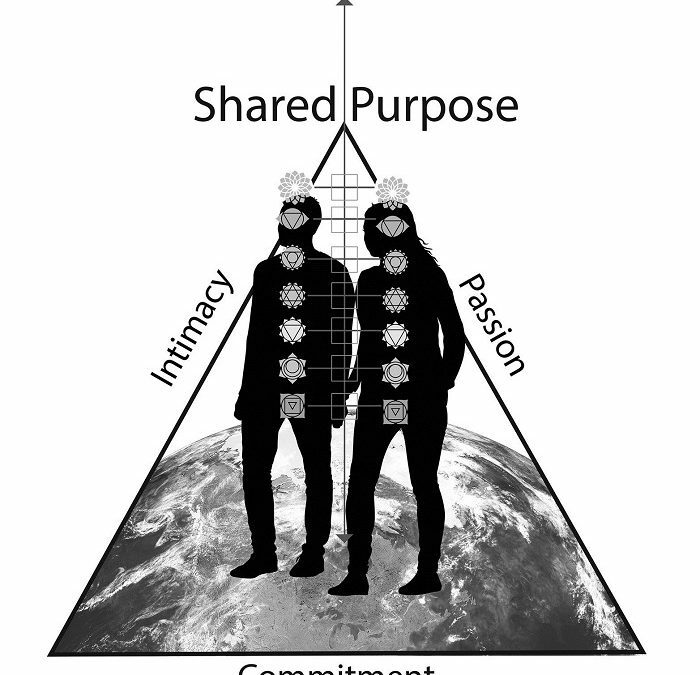 The collective (shared) interior “we” values, intimacy, ability to communicate, shared vision, etc. The collective (shared) exterior “Its” social environment such as money, home, lifestyle, transportation, etc. 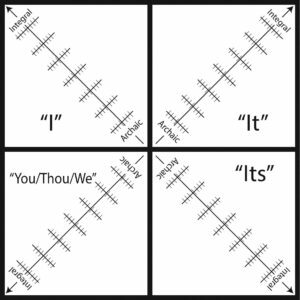 If one or both partners are (or become) unhealthy in one or more of these four dimensions, or if certain quadrants get elevated over others (called quadrant absolutism) or ignored, the relationship will suffer. 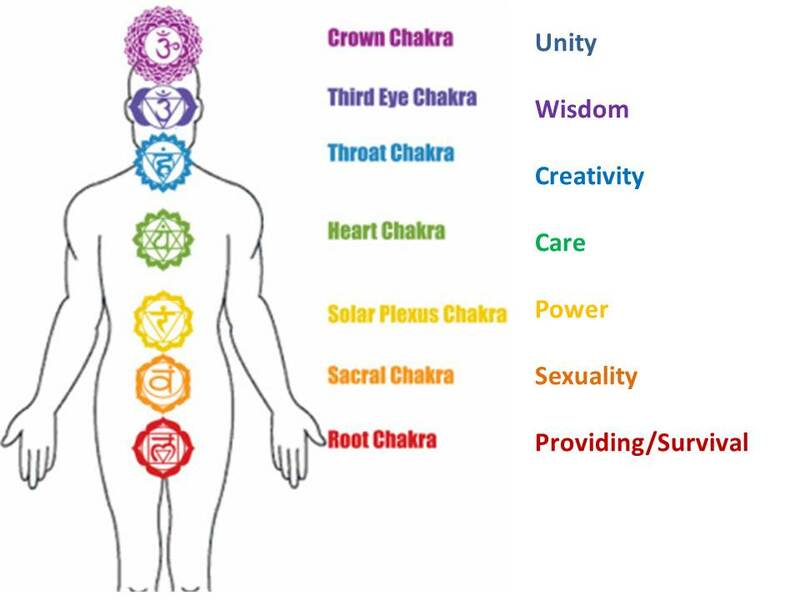 The seven chakras represent “energy centers” that you can experience right now. At the Root is your energy to survive, such as food and safety. At the Sacral is your sexual energy. At the Solar Plexus is your energy for protection and self-determination (power). At the Heart is your energy for empathy and care. At the Throat is your energy for self expression and creativity. At the Third Eye is your energy for intuition, deep insight and wisdom. At the Crown is your energy for oneness or unity (with all existence or the ground of all being). In an Integral Love relationship, partners co-create at the level of all seven chakras in all four quadrants. The Integral Relationship model equates ascending and agency with masculine qualities and descending and communion with feminine qualities. Males and females have equal potentials to develop each of the four polarities in healthy or unhealthy ways. As you can see in the image below, one can either be agentic or communal, or ascending or descending, but not communal and agentic or ascending and descending at the same time. Healthy ascending is characterized by a desire to improve, to go beyond, to grow, to transcend, to create, and to think big. Unhealthy ascending ignores, represses, controls, and dominates the lower instead of embracing and caring for it. It denies feelings, the body, sexuality, and nature. Pathological ascenders fear getting dragged down, engulfed, absorbed, and lost. Healthy descending means being connected with and sensitive to the richness and fullness of the world and being down-to-earth and in touch with one’s body, feelings, emotions, and sexuality. Unhealthy descending means being overwhelmed, fused with, and run by the many details of life and its manifestations, feelings, earthly desires, and needs. Pathological descenders fear losing touch, to get lost, and being dissociated from the fullness of life and its forces. Healthy agency supports the autonomous functioning of the individual, group, organization or society. Agentic people fear losing the freedom to make independent choices and becoming dependent on others for their well-being. Healthy communion is expressed through the peaceful, responsible (response-able), considerate, and caring connection between people. Unhealthy communion leads to fusion, dependency, neediness, and clinging—with the loss of one’s own will, individuality, and autonomy—which eventually leads to resentment. Communion-oriented (communal) people fear that they will be abandoned, unsupported, and alone. 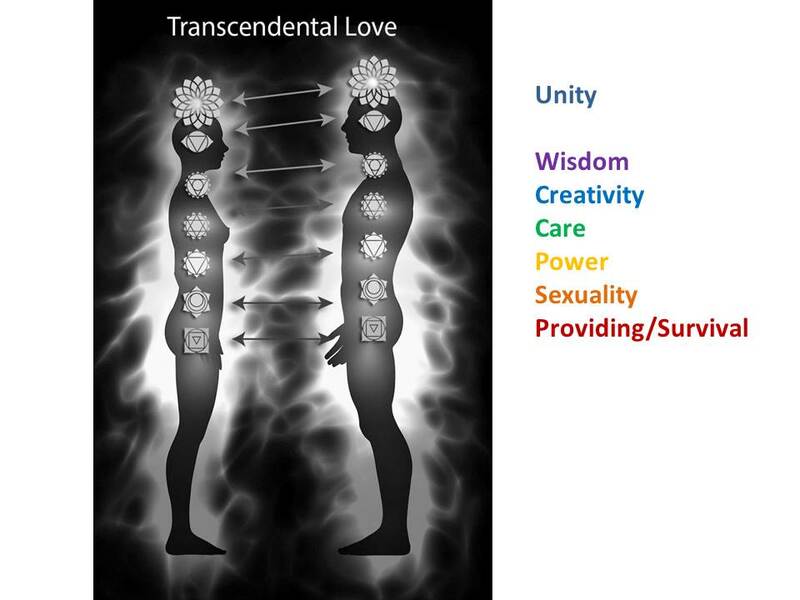 This brings us to the image below, in which equal and opposite partners with a shared Transcendental Purpose and the same rights and responsibilities in the domestic and public sphere co-created between them in all four quadrants at the level of all seven chakras by balancing and harmonizing healthy feminine and masculine polarities. 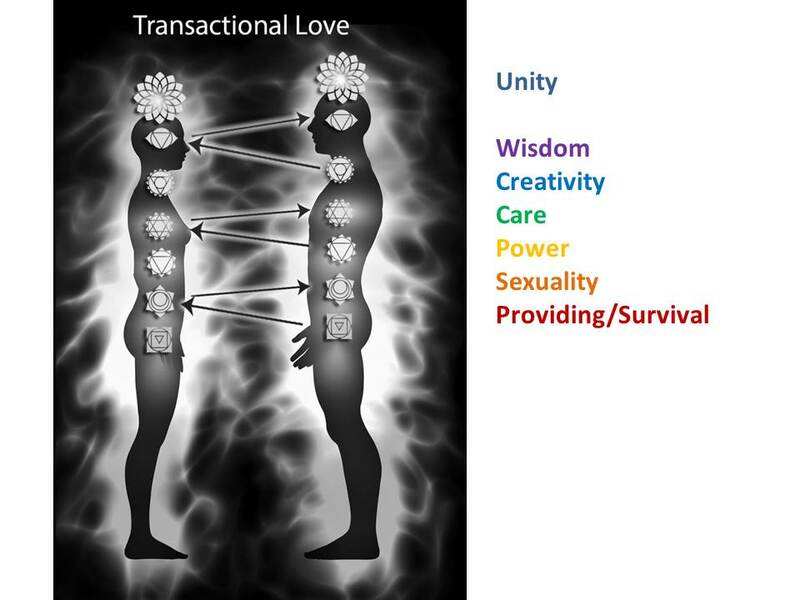 How this Integral Love Relationship manifests at each level of the seven chakras depends on the level of consciousness of the couple as show in the matrix below. 7. Asymmetrical transactional love relationships. 8. Symmetrical transcendental Integral Love Relationships. 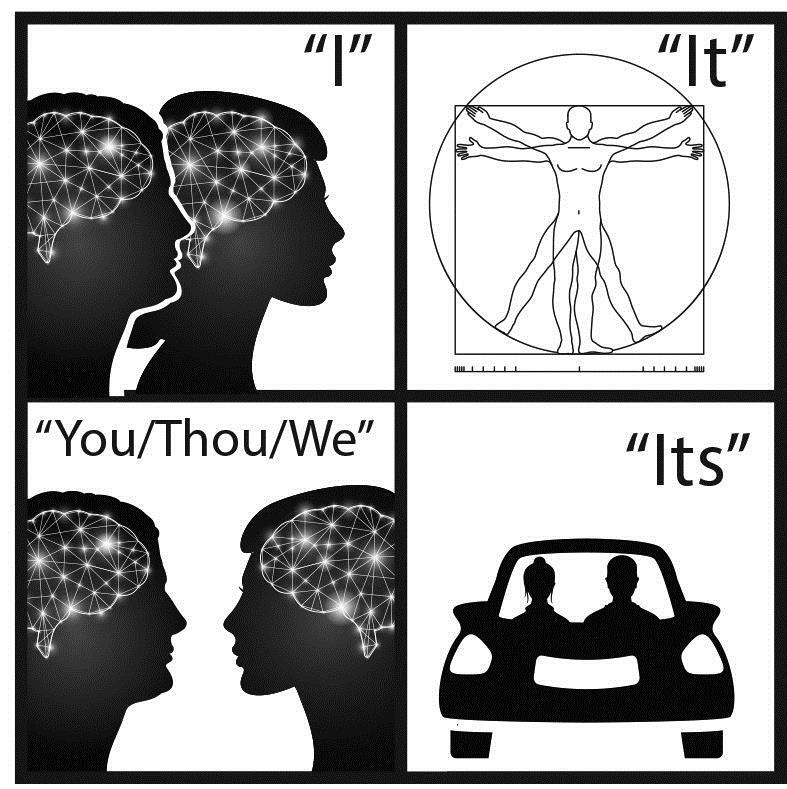 In which both partners co-create at the level of all seven chakras. 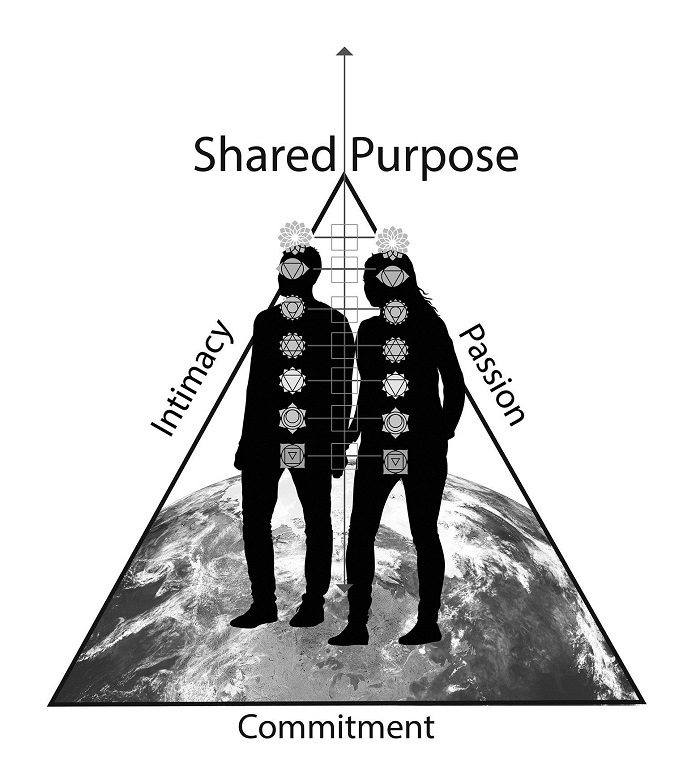 The entire Integral Love Relationship model is shown below with Intimacy, Passion and Commitment between couples with shared Biological and Transcendental purpose.